Comparison of ligand specificity, including substrates, co-factors, inhibitors, etc. 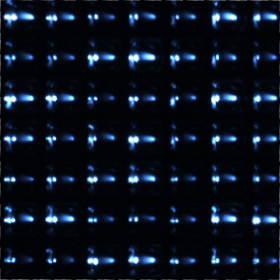 Stargazer-2 measures protein aggregation through the scattering of visible light. No fluorescent probes are used, meaning samples which were previously difficult to screen using DSF are now readily available using Stargazer-2's label-free technology. 384-well microplates, heating rates up to 5°C/minute and short cool-off times translate into high throughput and fast results. 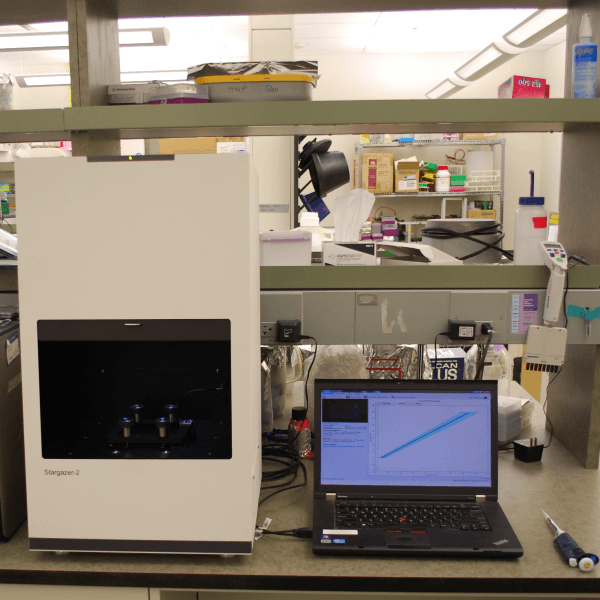 Using a standard, low-volume 384 well optical bottom microplate, Stargazer-2 is capable of simultaneously collecting data from up to 383 samples per experiment. Stargazer-2 can detect aggregation in samples as low as 2.5 μL/well with typical concentrations from 0.05 mg/mL to 1 mg/mL. Fluorescent proteins or compounds getting in the way of DSF? Try Stargazer. 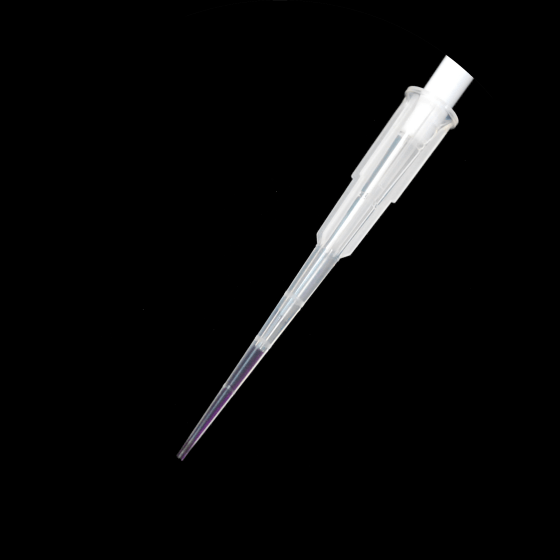 Stargazer-2's non-specific, label-free technology is unaffected by fluorescent samples. Contact us and discover the benefits of adding Stargazer to your lab bench. We took the original Stargazer-384 instrument and redesigned the hardware and software from scratch. The result is Stargazer-2 — faster, more accurate, and easier to use. 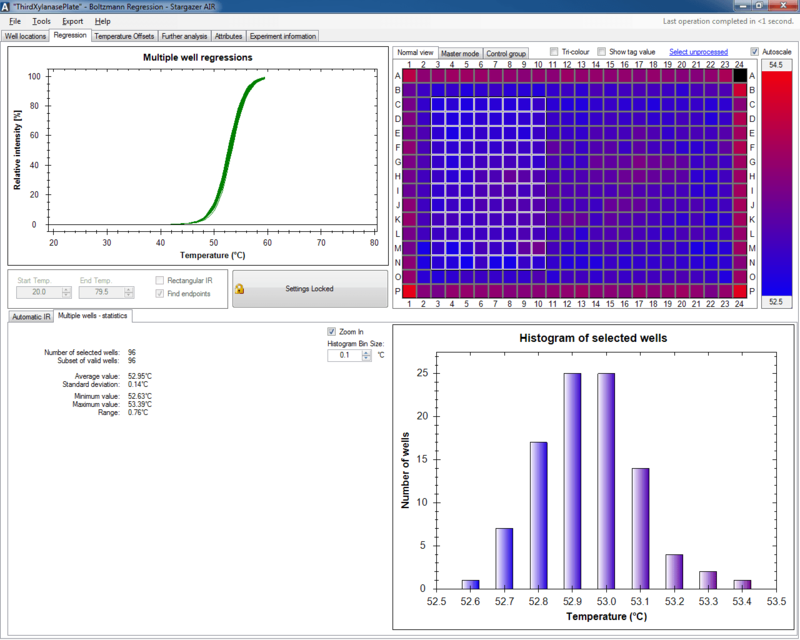 Stargazer's Magellanic control software allows users to customize the operation of Stargazer-2 to their needs with method-based experiments. Stargazer-AIR automatically processes experiment results and provides the user with an intuitive graphical interface to review their results. A modular plugin architecture allows users to export results to Excel and BioActive. LIMS integration is possible with custom plugins. Online software updates ensure the best user experience. Vedadi M, Niesen FH, Allali-Hassani A, Fedorov OY, Finerty PJ Jr, Wasney GA, Yeung R, Arrowsmith C, Ball LJ, Berglund H, et al. 2006. Chemical screening methods to identify ligands that promote protein stability, protein crystallization, and structure determination. Proc Natl Acad Sci U S A. 103(43):15835-40. Senisterra GA, Markin E, Yamazaki K, Hui R, Vedadi M, Awrey DE. 2006. Screening for ligands using a generic and high-throughput light-scattering-based assay. J Biomol Screen. 11(8):940-8. Vedadi M, Lew J, Artz J, Amani M, Zhao Y, Dong A, Wasney GA, Gao M, Hills T, Brokx S, et al. 2007. Genome-scale protein expression and structural biology of Plasmodium falciparum and related Apicomplexan organisms. Mol Biochem Parasitol. 151(1):100-10. Hong BS, Senisterra G, Rabeh WM, Vedadi M, Leonardi R, Zhang YM, Rock CO, Jackowski S, Park HW. 2007. Crystal structures of human pantothenate kinases. Insights into allosteric regulation and mutations linked to a neurodegeneration disorder. J Biol Chem. 282(38):27984-93. Senisterra GA, Ghanei H, Khutoreskaya G, Dobrovetsky E, Edwards AM, Privé GG, Vedadi M. 2010. Assessing the stability of membrane proteins to detect ligand binding using differential static light scattering. J Biomol Screen. 15(3):314-20.